The GBPUSD moved higher earlier but reversed course on Brexit concerns. 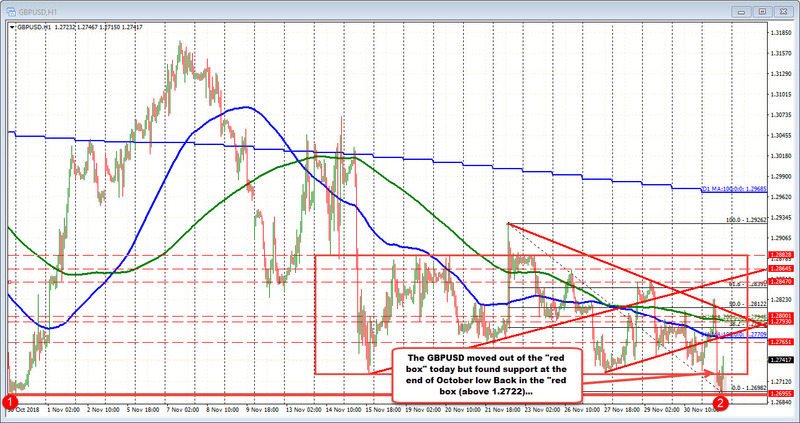 The move lower took the price outside a "red box" on my chart that defined most of the trading since November 14. The low for the box was at 1.2722. The high was at 1.2882 (there was an extension above that failed back on November 22). Today, the low extreme was breached, but the end of October low at 1.2695 found buyers (low reached 1.2698). The price rebounded and moved back into the "red box". We currently trade at 1.27417. The 1.2722 is risk for dip buyers now as sellers failed. They had there chance. Is it full steam ahead for the buyers? No. The price can reverse and go back lower easily. However, if the 100 hour MA at 1.27709 is breached above, followed by the 200 hour MA at 1.27948 (green line), the bias would turn more bullish. Needless to say, the "red box" has consolidated a number of levels (swing highs, trend lines and retracements in addition to the 100 and 200 hour MAs). At each level, the market has the potential to swing one way or the other. Right now, however, the sellers had their shot. So be on the lookout at the 1.2722 area for dip buyers. If the price stays above, that could lead to more upside momentum.